1 teaspoon to knead maida. Then add onion. After the onions turn transparent, add turmeric, chilli powder, salt and heat for a few more seconds. Then add the boiled potatoes (smashed). Add peas and green coriander if desired. And the filling is all ready. Now, make balls out of the dough (size that of a puri).Cut it into half. 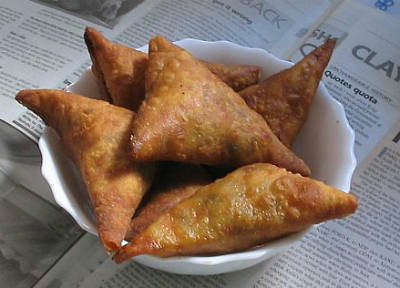 Use these 2 halves to make 2 samosas. Put the filling onto the centre. Fold as a triangle. Fry them. Arrange them in a plate. Now sprinkle some chat masala on to them.Your samosas are ready… and enjoy the party. Feel free to comment or share your thoughts on this Cocktail Samosas Recipe from Awesome Cuisine.